Garlic sales are going well! We started mailing our garlic orders today! We plant our garlic around October 10th – 4 to 6 weeks before the hard freeze. So you still have lots of time to get your order in! We have 23 varieties of garlic for sale this year. We are selling it by the bulb (recommended if you want to use it to replant) or bulk (smaller bulbs – ideal for eating). Go to the “Order Garlic” tab for more details. Our garlic is curing slowly but surely and will be ready for sale on August 28. 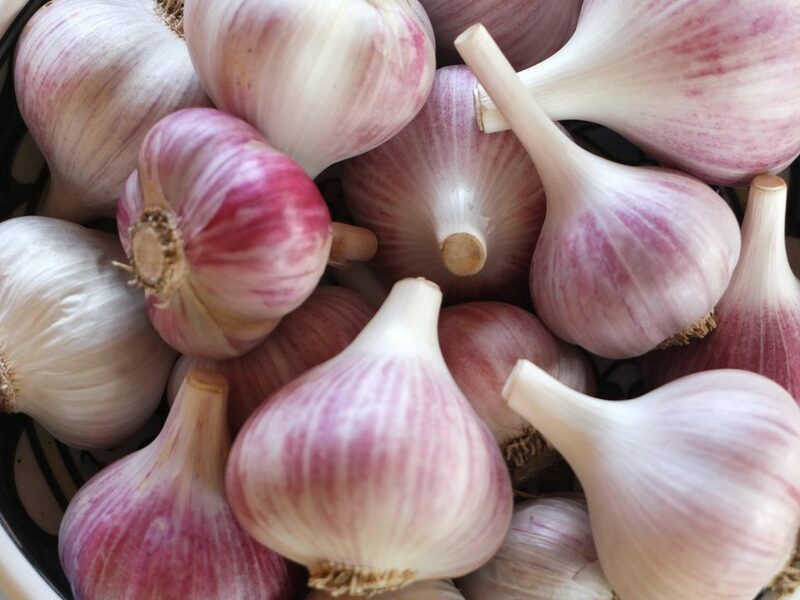 Some varieties are fabulous-looking – check out our Linda O’Lesky, a mild tasting garlic. Be sure to get your order in. For more information, you can email us at mayo.hill.garlic@gmail.com or check out the “Order Garlic” tab. This weekend, we finished harvesting all our varieties of garlic – 35 in total. All this fresh garlic is now on the drying racks. It will stay for about 3 weeks, after which we will clean it and get it ready for sale. For your orders, or more information, please send us an email! We have harvested several kilograms of scapes. If you are in Ottawa-Gatineau region and would like to purchase some, please to the “Order garlic” tab. We are selling our scapes $10/kg and can deliver in central locations in Ottawa or Gatineau. Most of our garlic varieties are doing really well and we expect a very nice crop. We can’t wait for the scapes to be ready – a first opportunity to eat tasty garlicky food (see our recipes section for scape recipes).